After a grueling competition and a dramatic, last-minute tiebreaker, three cadet companies will get to enjoy special privileges after coming out on top. 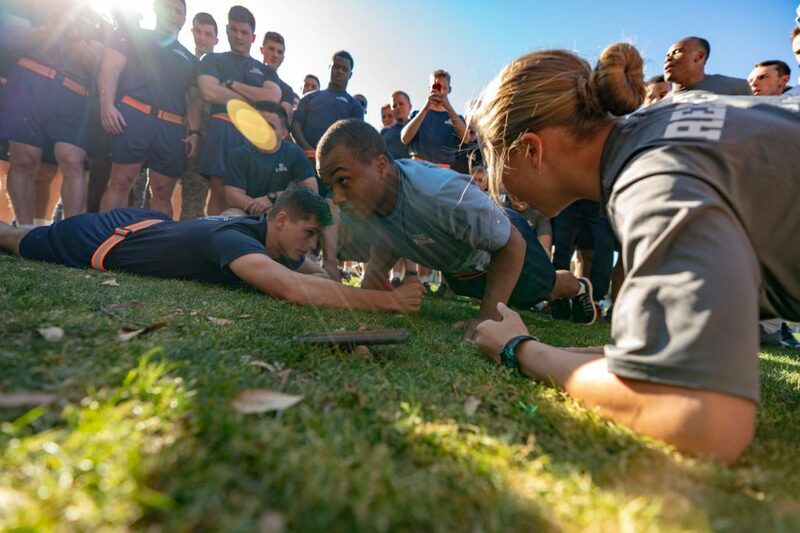 To break the tie for first place, the athletic officers from Kilo and Palmetto Battery faced off in a push-up competition. But in the end, Kilo Company came out on top. each event, and all those points were totaled to determine the company that earned first, second, and third place, overall. As a reward for winning first place, cadets in Kilo will be excused from the Saturday morning inspection, which include personnel, rooms, arms, equipment and common areas of the barracks. 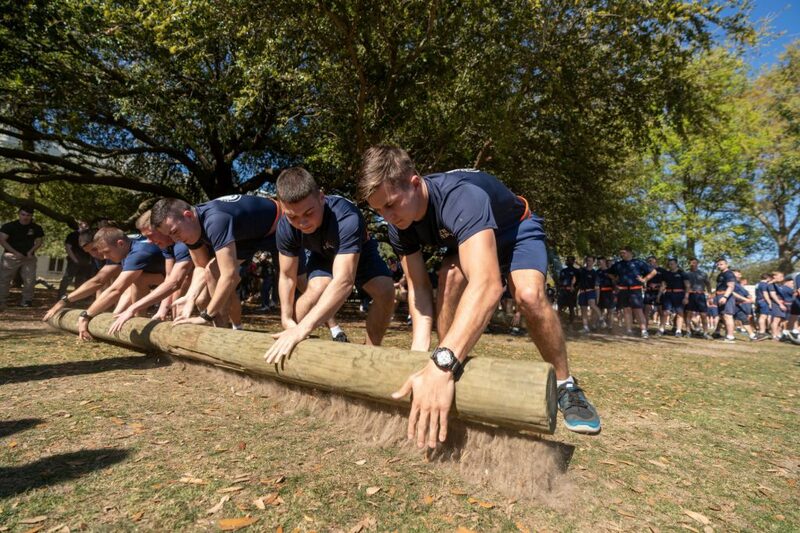 For coming in second place, Palmetto Battery cadets will be excused from Monday morning personal training, giving them the rare opportunity to sleep in. And for a third place prize, the cadets in Oscar will be awarded a block overnight, which gives them one extra night they’re allowed to stay off campus. 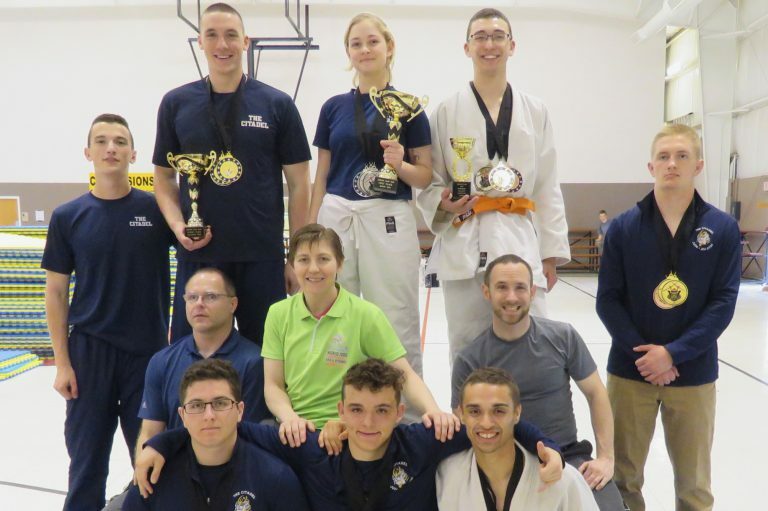 The Citadel Judo team is training for its next competition after taking first place in the senior category during the recent Southeast Regional Collegiate Judo Championships in Summerville. The Citadel hosted tournament included junior, collegiate, and senior judo teams from the University of Florida (UF), University of Tennessee, University of West Georgia, University of Central Florida, and several others. The Citadel beat UF’s Gator Judo in the senior category by a narrow margin of 51 to 46. In reply, UF won the collegiate category, with The Citadel placing second. “The Citadel Judo athletes have really developed in the past 6 months. It is an honor to coach each one of these dedicated athletes,” said Lisa Capriotti, Ph.D., The Citadel team’s coach, 2016 World Veteran Jiu Jitsu Champion, and chemistry professor. Capriotti reported that two notable players were team captain, Joshua Malott, who won the Men’s Collegiate under 73kg Novice Division, and Matthew Dixon, who won the Men’s Collegiate Under 90kg Novice Division. The team will travel to West Point for the National Collegiate Judo Championships March 23. According to Capriotti, the team has a gofundme.com fundraiser underway, and is planning a BBQ fundraiser on campus for staff and faculty later this month to help cover the travel costs. The date will be announced later on DogNews and on the team’s Facebook page. Former Sam Houston State running back Remus Bulmer announced earlier this month that he would transfer to The Citadel as a graduate student for his final season of eligibility. Bulmer, 5-7 and 185 pounds, rushed for 2,117 yards and 15 touchdowns in four seasons at Sam Houston State, a member of the FCS Southland Conference. He averaged 6.1 yards per carry over his first three seasons. But this season, Bulmer had just 27 carries for 119 yards in the Bearkats’ first three games when he decided to take advantage of the new rule that allows players to participate in up to four games and still take a redshirt year. Bulmer left the Bearkats after three games and took a redshirt year, allowing him to transfer as a graduate student for his final season. He hopes to get more opportunities to run the ball in The Citadel’s triple-option offense. Among high school prospects, The Citadel has commitments from at least 14 players who could sign early. Among them is Lowcountry product Tereis Drayton, a 6-2, 270-pound lineman from James Island Charter High School who played in the North-South All-Star Game. Among state players are linebackers Michael McDowell (6-1, 215) and Logan Billings (6-0, 200) from Boiling Springs High; linebacker Nicoles Rogers (6-1, 223) from Blythewood; defensive backsJake Kenison (6-1, 195) of Hillcrest and Antareus Pressley (6-1, 155) of Belton-Honea Path; lineman Stephon Stokes (6-2, 290) from Greenville; and linebacker Jaloveon Lagroon (6-2, 200) from T.L. Hanna. Stokes also was chosen for the North-South game, while Billings was selected for the Shrine Bowl. 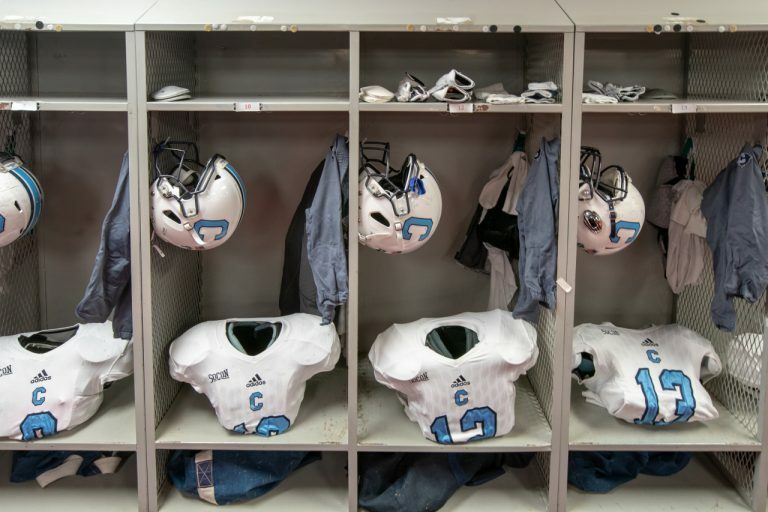 Citadel coach Brent Thompson will hold a Wednesday press conference to discuss the new recruits. From his third-row seat in the Bryant-Denny Stadium press box, Parker King set the college football internet ablaze. He said he’s “just a graphic designer,” but King was the name behind The Citadel football team’s Twitter account that went viral during the 50-17 loss at Alabama. The regimented military school let its hair down Saturday in Tuscaloosa and the masses noticed. Their big tweet of the day followed a second-quarter touchdown that tied the score 7-7. It ended Alabama’s shutout streak that covered both the LSU and Mississippi State wins and King was well aware. The graphic King made when they arrived Saturday topped it off. As of Saturday afternoon, it had 14,000-plus favorites and north of 6,000 retweets. It drew a wide variety of responses. King laughed when asked about the mentions the account received. Of course, it was all in good fun. None of the schools called out responded, nor did King expect they would. It was a rare opportunity for the school of 2,300 students to get this kind of national stage. They spent the week preparing and dropping a few early tweets to prime the engine. As of Saturday afternoon, the account picked up 1,500 new followers on game day up to the 12,800-range. After scoring 10 points before halftime, Ole Miss was next. Alabama beat Ole Miss 62-7 in Week 3. For the 2016 graduate of South Florida, a touch of anxiety crept in when pulling the trigger on some of the SEC call-out tweets. 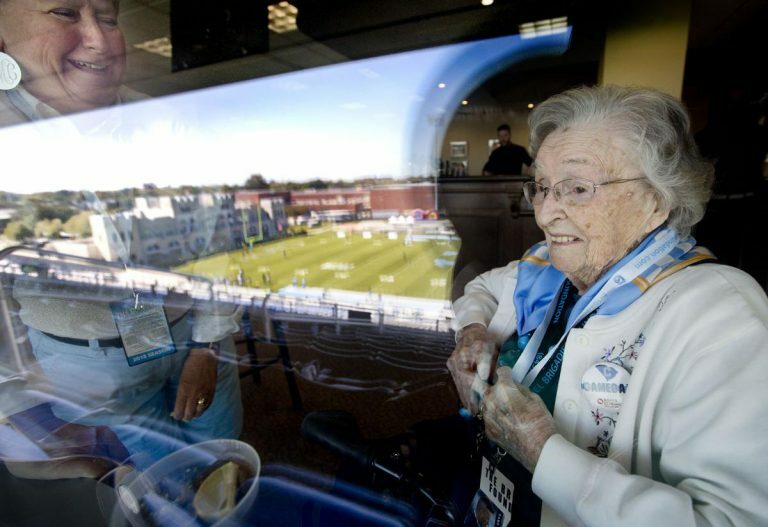 It’s game day at Johnson Hagood Stadium, and the oldest living fan of Citadel football settles into her place. On the fourth-floor club level, Helen McCoy, 101, is seated smack in front of the window near the 40-yard line. She’s surrounded by family and fellow Citadel fans, gazing at her beloved Bulldogs on the green grass below. “We moved down here in 1976, and I’ve been a fan ever since,” Miss Helen says. “Actually, it was 1967,” gently corrects her son, Peter. Whatever the date, Helen McCoy has been a Citadel fan for a long, long time. 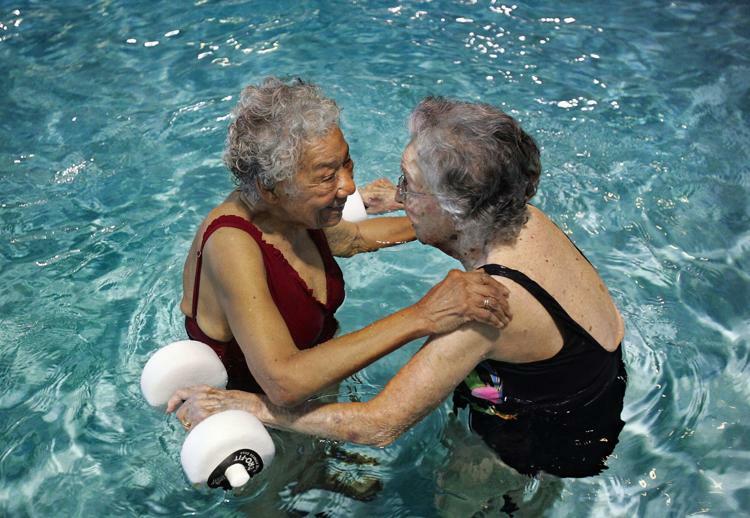 She’s the oldest member of The Brigadier Foundation, which raises money for athletic scholarships. 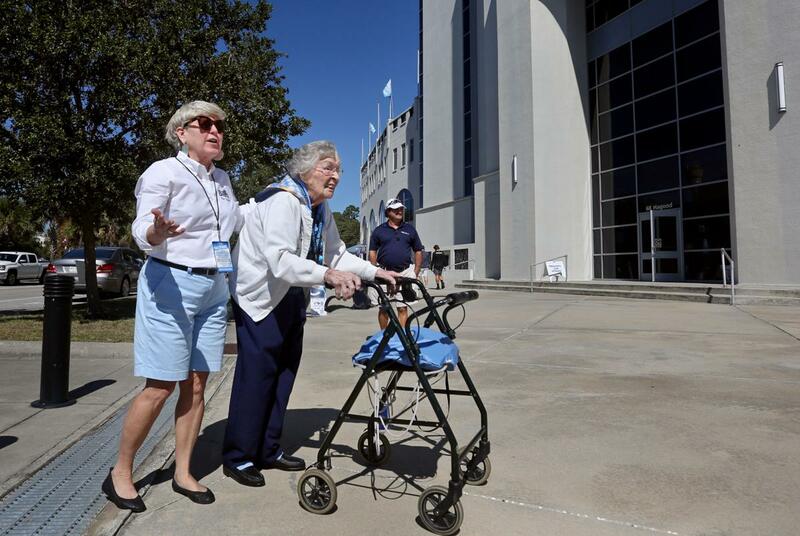 And though such rankings are unofficial, she might be the oldest living Citadel fan. She will turn 102 on Dec. 4. “She’s a huge fan and really means a lot to us,” says Citadel football coach Brent Thompson. “I first met Miss Helen at the women’s football 101 class we held a couple of years ago, and immediately fell in love with her. Miss Helen’s attachment to the Bulldogs began before her son, Peter, attended The Citadel on a wrestling scholarship. He graduated in 1974. During Peter’s wrestling career at The Citadel, Helen became something of a “team mom,” coming to all the matches and even helping to drive the team to away contests. 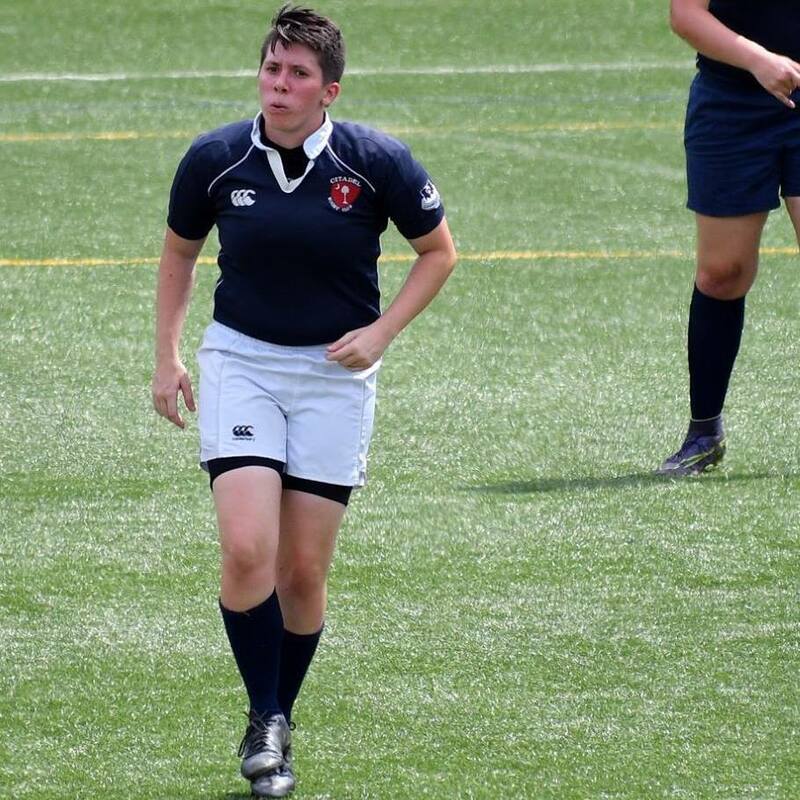 Helen McCoy was born in New York, playing sports such as field hockey in high school and eventually going to nursing school. She worked at St. Francis Hospital when it was located downtown, and was married for 60 years to Dr. J. Joseph McCoy, who was a pathologist at the VA hospital in Charleston. He died in 2002. Around that time, attending Citadel football games became a routine for Miss Helen, who has 11 grandchildren and 19 great-grandchildren. 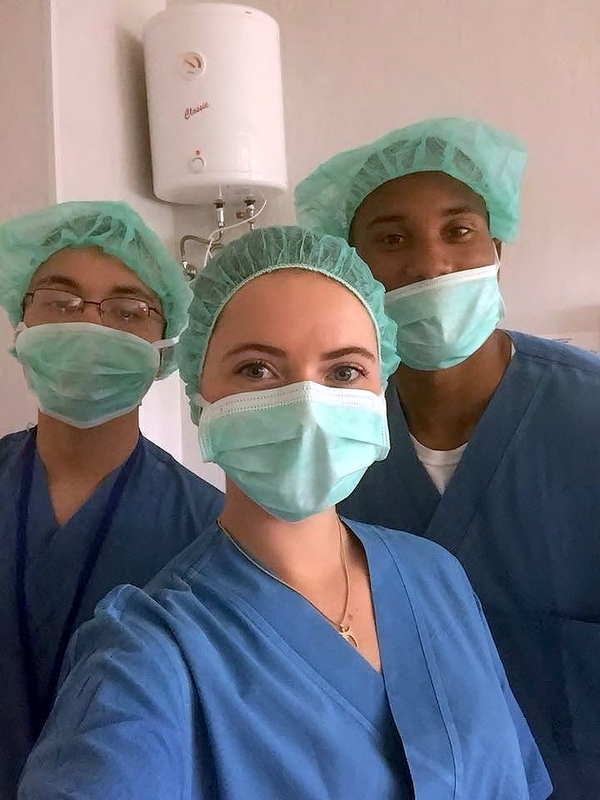 Miss Helen, who has had two hip replacements and a knee replacement, now lives with another son, orthopedic surgeon Dr. James Joseph McCoy, in West Ashley. The 2015 and 2016 seasons were particularly fun for Miss Helen, as The Citadel won back-to-back Southern Conference championships. 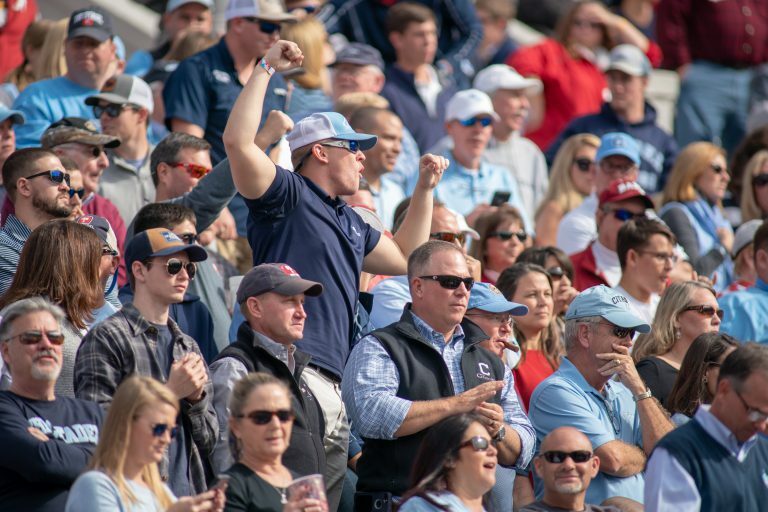 Miss Helen plans to be back at her spot at Johnson Hagood Stadium on Saturday when the Bulldogs play rival Furman University, her favorite drink perched on the ledge in front of her. Asked the key to her long life, Miss Helen points at the cup. “Rum and Coke,” says Peter as Miss Helen laughs. 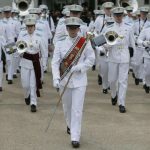 The Military Classic of the South is Saturday Oct. 20 when The Citadel Bulldogs play the Virginia Military Institute at VMI. The game has been played between the two Senior Military Colleges since World War II. 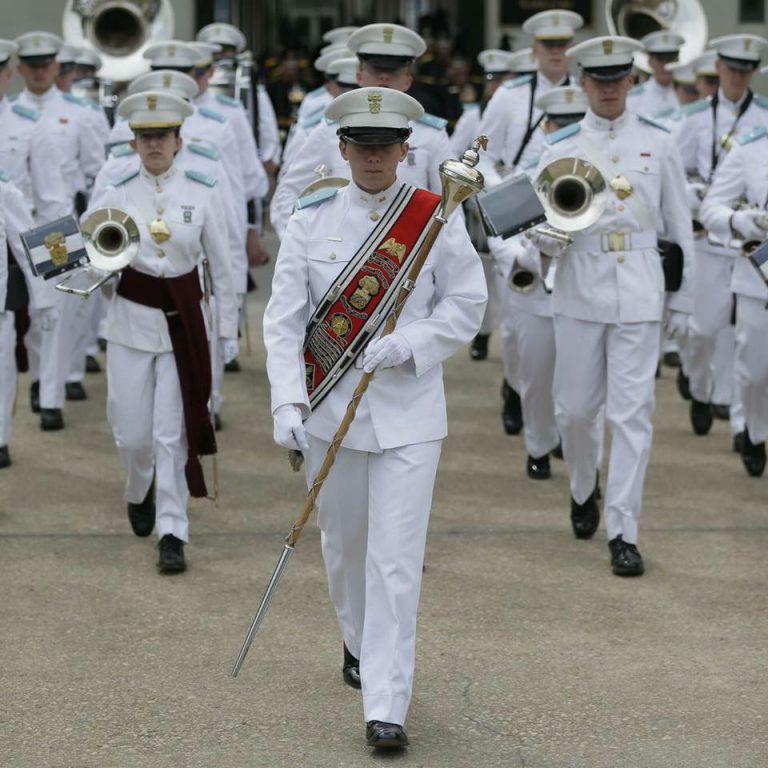 The Citadel has owned the games in recent years, holding on to the coveted Silver Shako for eleven consecutive years, winning 15 of the last 17 matches. 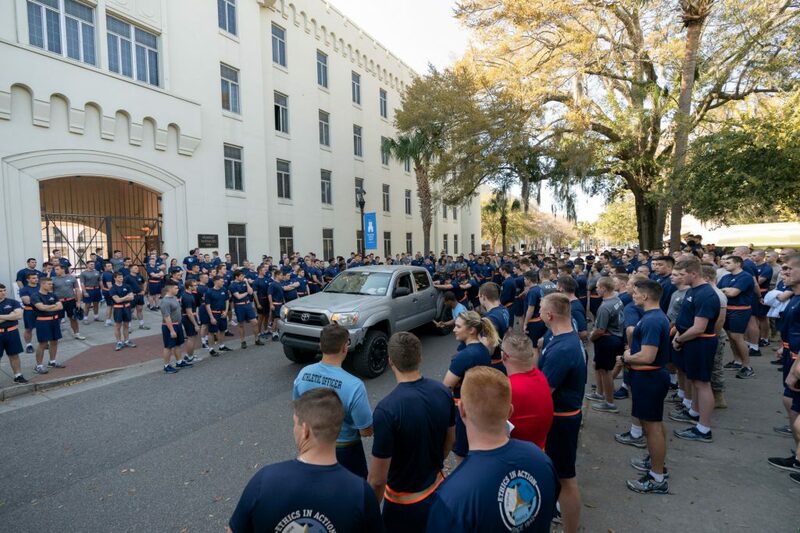 Led by Citadel junior, Rhaei Brown, Regimental Public Affairs NCO and editor of the college’s Brigadier, cadets share their thoughts on the predictions. 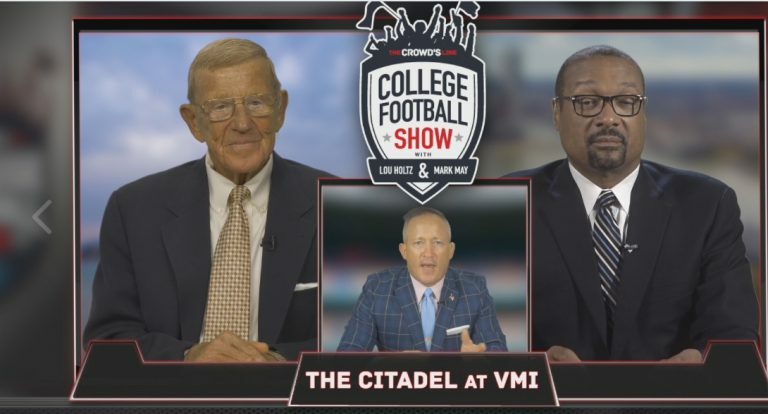 Week 8: Lou Holtz and Mark May Break Down The Citadel at VMI from The Crowd’s Line on Vimeo. It was spring break 2014. My family and I were on a college search adventure when we stopped at The Citadel. I knew nothing about the school, only that it was a military college. I certainly did not realize that this brief stop at The Citadel would start a life-changing transition taking me from my home in Kannapolis, North Carolina, to my new home in Charleston, South Carolina for the next four years. On September 20, 1996, I was born to Sonya Green-Miller and Vincent Miller. My mother always stressed the importance of a great education as I was growing up. She inspired me to work hard to succeed in school and instilled in me a desire to make a difference in the world some day, in my own way. I started applying to colleges at the beginning of my senior year in high school. My mother asked me about The Citadel, reminding me of our visit there. I told her that I was not considering it, thinking it was out of my reach, but she persisted in encouraging me to apply, and because they waived the application for me, I was able to do it. One week after submitting my application, I received an acceptance letter. I was thrilled because the turnaround time was so quick. I strongly felt that God wanted me there for a reason. After a pre-knob visit where high school seniors get to spend a day and night on campus, followed by an interview with The Citadel Honors College, I knew that God was pushing me to go to The Citadel. However, I ran into some challenges on the way. Fast-forward to April 2015, two months before my high school graduation. I received my financial package and to my surprise, I was $9,000 in the hole. I vividly remember walking into my mother’s room before she went to work, crying to her that I was not going to be able to attend the place that had become my dream, the number-one military college in the South. My mother wanted to help but simply was not in the position to be able to provide the money. Immediately, I went to my room, got on my knees, and prayed for an answer. 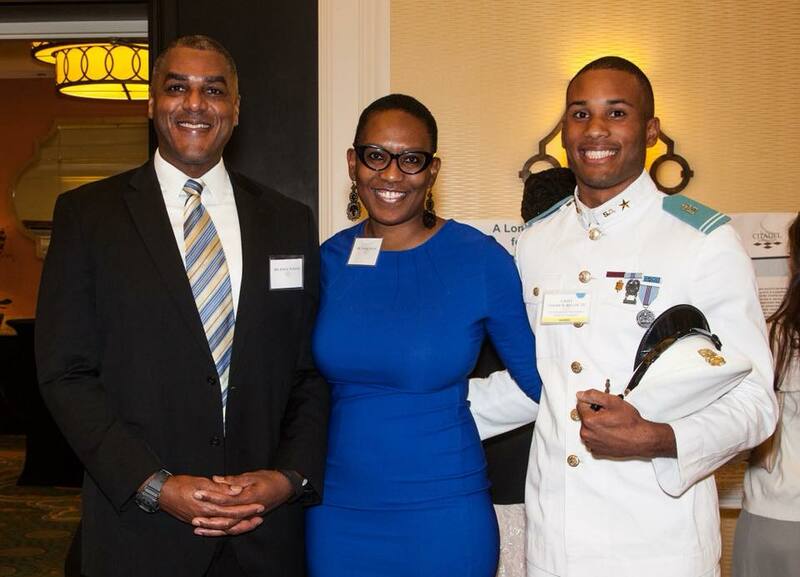 A few days later some generous strangers−four Citadel alumni−graciously donated funds to help with my tuition. Just like that, I matriculated with the class of 2019. Fast-forward again to three years after that. I am senior who has made the Gold Star and Dean’s List. I have traveled around the globe three times to study abroad. I have held positions of rank, including being Regimental Public Affairs Officer, and have been a varsity track athlete. I have earned several awards and am going to graduate with a degree in Health, Exercise and Sports Science. Finally, I find myself earning the band of gold! When I first set eyes on this beautiful campus, I never would have imagined this journey, but with God, anything is possible. To me, the ring represents honor, courage, and discipline. I know it will help me in my quest to become a physician’s assistant in the U.S. Air Force. 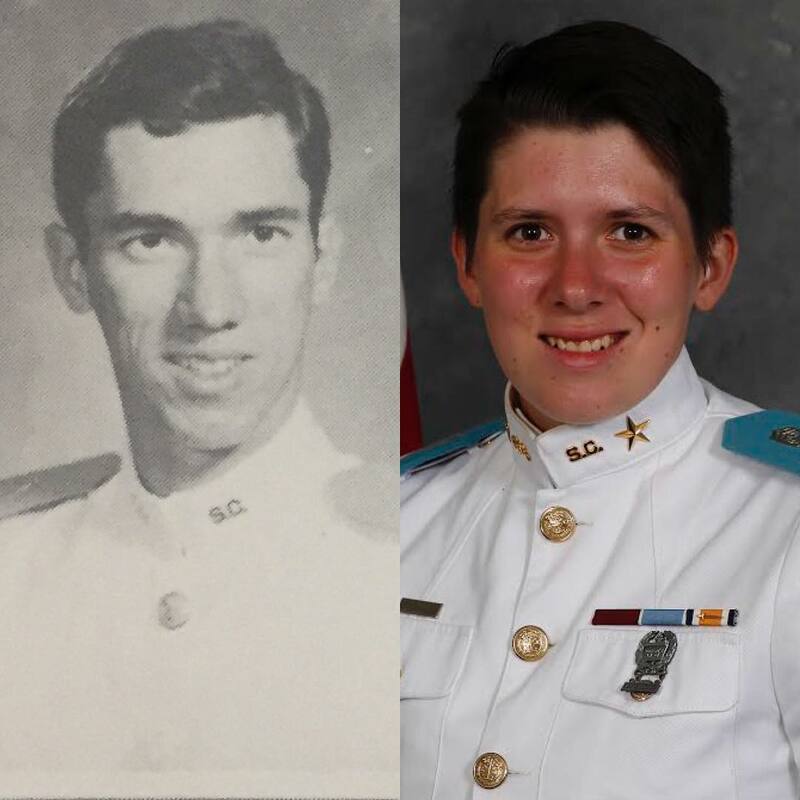 I am the first in my family to graduate from The Citadel, but I hope I am creating a legacy for others here. Thank you, Col. John Falkenbury, Mr. Brian Floyd, Senator Robert Hayes and Col. Russ Olsen, for making this journey possible. With the ring, I know I have the power to make a profound impact on the world. At the age of 14, Donnell Boucher was passionate about football, but when he realized that he was only going to be an average player, he revised his playbook and became passionate about what he knew he could do well. With precision focus that guides everything he does, Boucher sets his sights on becoming a strength and conditioning coach. 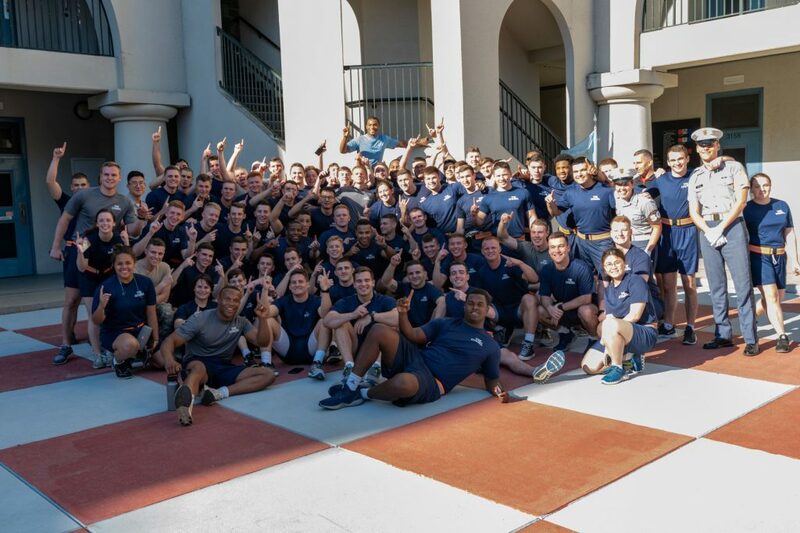 Now, the assistant athletic director for strength and conditioning and head strength coach at The Citadel, Boucher has realized his goal, but that has not slowed him down. He’s working harder than ever, and he is making an impact, not only in physical fitness, but in helping to develop principled leaders. At the small weight room in his hometown of Chicopee, Massachusetts, Boucher was the only high school freshman who could bench 200 pounds. When talk turned to workout programs, reps and sets, Boucher naturally understood the science behind strength and conditioning. As he set his course, he left no stone unturned. 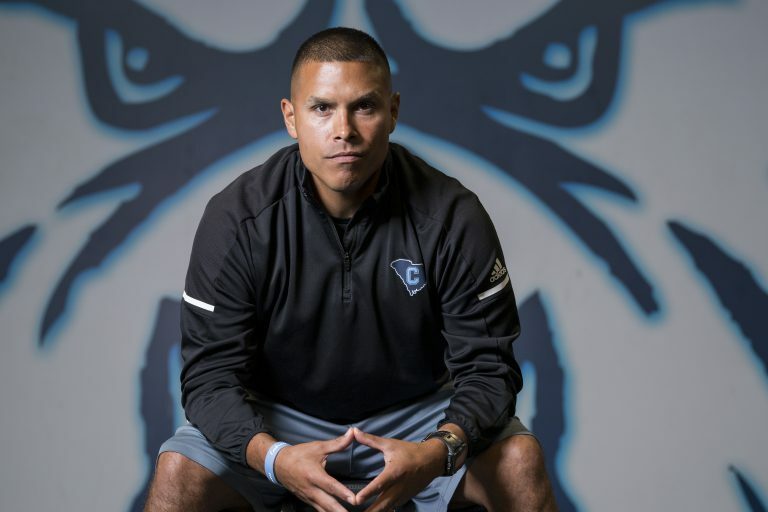 In 2007, when The Citadel offered Boucher a graduate assistant position in strength and conditioning and an opportunity to pursue his master’s degree in Health, Exercise and Sport Science, Boucher headed to Charleston. The military college was the perfect fit. One of the foremost leaders in the field of strength and conditioning according to Boucher is Carolina Panthers Strength Coach Joe Kenn. Kenn is also someone Boucher considers a mentor, and when Kenn offered advice, Boucher listened. As Boucher considered his mentor’s advice, he realized that education was a priority. Boucher began researching—visiting other places, learning what best practices are, and he decided a master’s degree in social science would help him to better understand people and be more effective in his career. As Boucher will attest: learning to understand people is the key to success. For Boucher, his work is all about challenge and taking advantage of opportunity. Boucher is constantly reassessing, measuring and setting new goals. It has been almost 12 years since Boucher first came to The Citadel, hoping to break into the field of strength and conditioning. 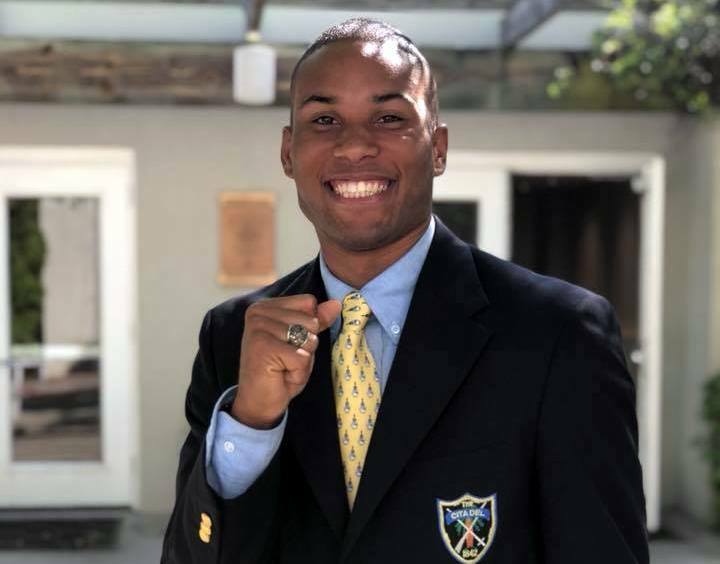 He is just as eager to make a difference today as he was then, and while he claims that he does nothing to motivate athletes, it is clear that he does so just by being Donnell Boucher. 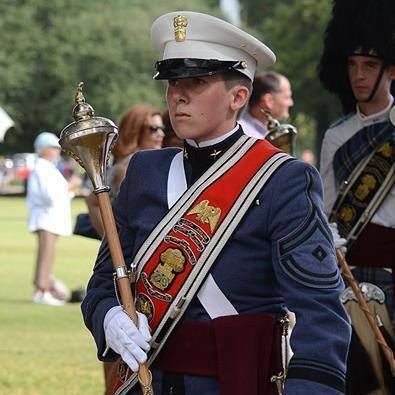 To view more student and cadet stories, visit mighty.citadel.edu.